Dr. Palejwala is a native of Southern California and completed her undergraduate studies at UCLA with degrees in Neuroscience and Biology. She obtained her medical degree at St. Louis University, and then went on to complete her neurosurgical training in 2017 at the University of Arizona. 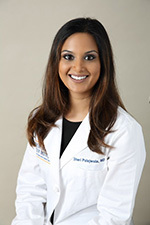 Dr. Palejwala recently completed an endoscopic, minimally-invasive surgical neuro-oncology fellowship at the John Wayne Cancer Institute with Pacific Neuroscience Institute in Santa Monica, California. Her clinical interests include endoscopic, keyhole, and other minimally-invasive approaches to tumors of the pituitary and skull base, while her research interests focus on clinical outcomes and anatomical studies focusing on the same. Dr. Palejwala has published over 30 peer-reviewed articles and book chapters, and has presented her findings at meetings worldwide. She is an active member of the American Association of Neurological Surgeons, the Congress of Neurological Surgeons, the tumor section of the AANS/CNS and the North American Skull Base Society.